Sunday afternoon is the Toronto Public Space Committee’s third annual Human River Walk, a trek along the course of the buried Garrison Creek, from Christie Pits to Fort York in a parade of blue, symbolically bringing the river back above ground for one beautiful afternoon. Along the route, there will be music, performances, and stories about the history of the creek, the neighbourhoods, the trees, and Toronto’s stormy relationship with its water. But, above all, it is a parade and much fun for the whole family—really! We depart from the Christie Pits gazebo around 1:00 and wind up at Fort York around 4:30, for a reception celebrating the Human River Art show currently on display at the Fort, featuring pieces by professionals, schoolchildren, and everyone in between, exploring the connections that bind Torontonians to the natural fabric of our urban landscape. And, speaking of fabric, don’t forget to wear blue. 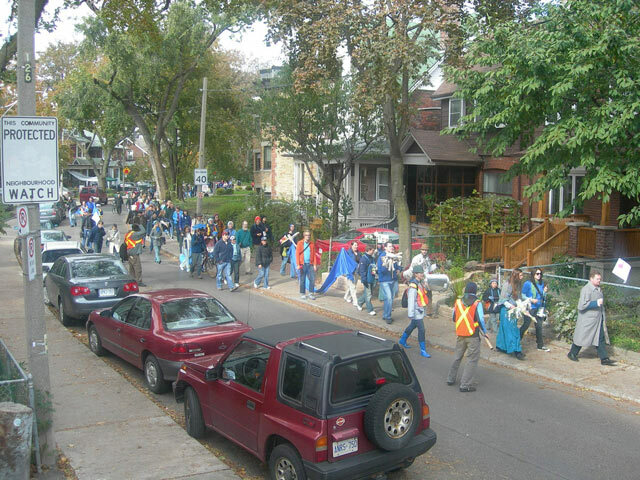 Photo from last year’s walk (featuring a remarkably Waldo-like Shawn Micallef) by HiMY SYeD on Flickr. Jonathan Goldsbie is a member of the TPSC but likes to think he would heartily endorse the Human River Walk even if he were not.